Pre-heat oven to 200°C, gas mark 6, take lamb leg, make 6 small deep incisions randomly over leg. Stuff each hole with the 6 gloves of garlic. With a food processor, blend together the head of peeled garlic; rosemary and lemons, and then next add the sea salt. Take paste and rub all over lamb leg, cut the two lemon in half and sit lamb leg on a baking tray on top of the lemons, cover with foil and allow 20 minutes per 500g cooking time. Turn once in cooking process, then rest for at least 20 minutes after cooking time, take baking tray that the lamb was cooking in, heat on stove top, add red wine, reduce by half then add lamb stock and reduce by half again, then pass through a fine sieve. 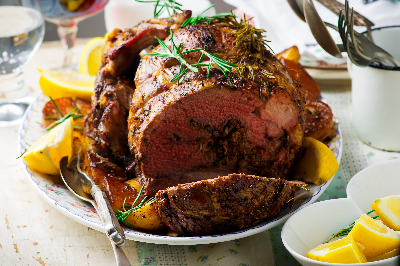 Slice lamb and serve with roast potatoes, honey roast parsnips, thyme buttered Savoy cabbage and Yorkshire puddings.